It's not crooked or wonky; it's perfectly square but the wild grass and weeds in the lot beside us make for a not-flat setting! If this pattern looks a little familiar to you, hooray! You're right! 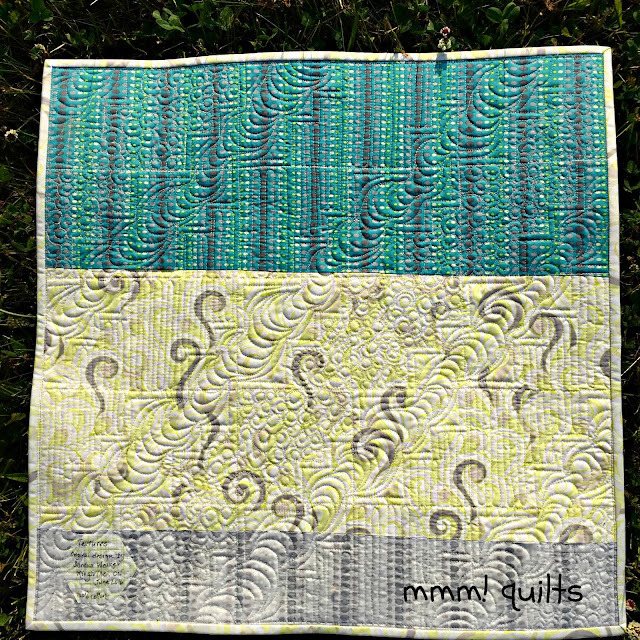 It's my Blue Skies & Sunny Days pattern here or click the sidebar button in my pattern store. Until midnight tomorrow it is on sale for just $5. But it's a little different: it's a mini!! It measures just 20" square! 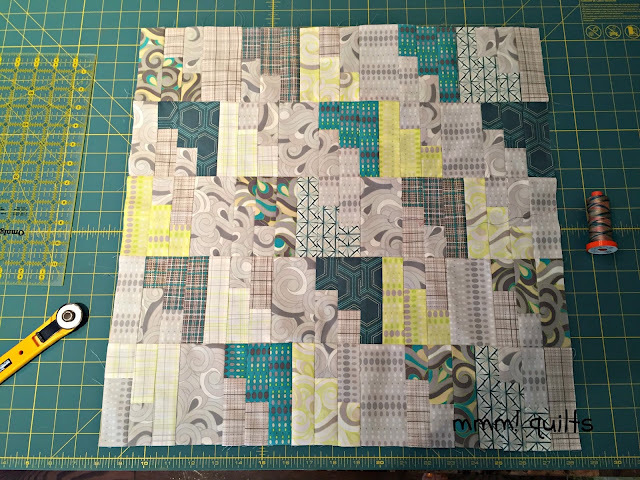 It was another good exercise in quilt math, reducing a larger block to half size. You betcha, there will be a future post on how to do that correctly; I learned the hard way with the centre block for the Mini Round Robin I'm in. Do you see a mistake in the flimsy? I didn't until I had started ditch-stitching... Look in the lower left corner in the above photo. It's now fixed. Phew! Had to unpick it or it would have driven me nuts. It uses scraps from my Summer Breeze quilt, (ha, that post is almost exactly 2 years ago) all Angela Walters fabrics by Art Gallery Fabrics. The majority are from her Textures line, with a couple from her Legacy line. I experimented with using all three greys for the background and paid little attention to how they fell within each block. Yup, that made me a little twitchy. I did the Blue Skies pattern, as in a square quilt, but used the Sunny Days construction method. 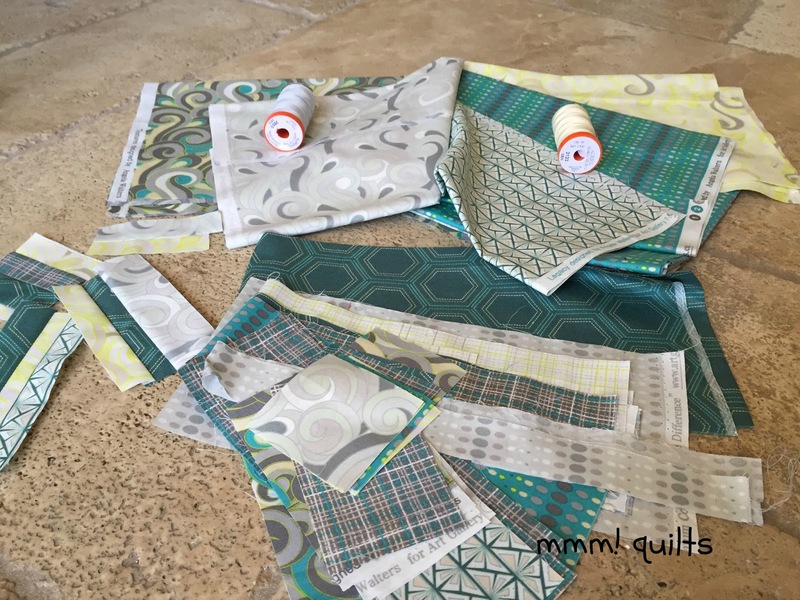 The pattern gives you both sizes and both construction methods, one using nothing but strips, the other strips and yardage which results in less seams and therefore less thread and fabric. Label applied using Lara's Crafted Appliqué technique - that link takes you to her current giveaway which ends tomorrow, and entails revisitng all the hops but not the CA blog hop post! She is having you visit a new post from each of the bloggers so you see what else they get up to. Such a great, and typically sweet and generous Lara, idea. With the variety of quilting, I thought the name Textures was à propos for this little quilt. My good friend Tish, partner in crime, now partner in birthing a new male quilter, put me onto the idea of Plexiglas. On one of his many trips to Lowe's, I got MacGyver to pick me up a piece of it; it measures 28X30". I grabbed a pack of erasable markers and an eraser at Staples, and tried it out on this little quilt. It is an awesome tool to have added to my quilting supplies! 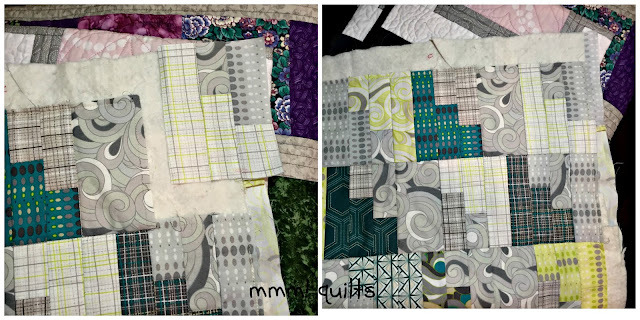 In the coloured sections I alternated between a really cool way of doing double pebbles that I saw Natalia Bonner do in a video, and back and forth lines which were inspired by the plaid fabrics in the quilt. 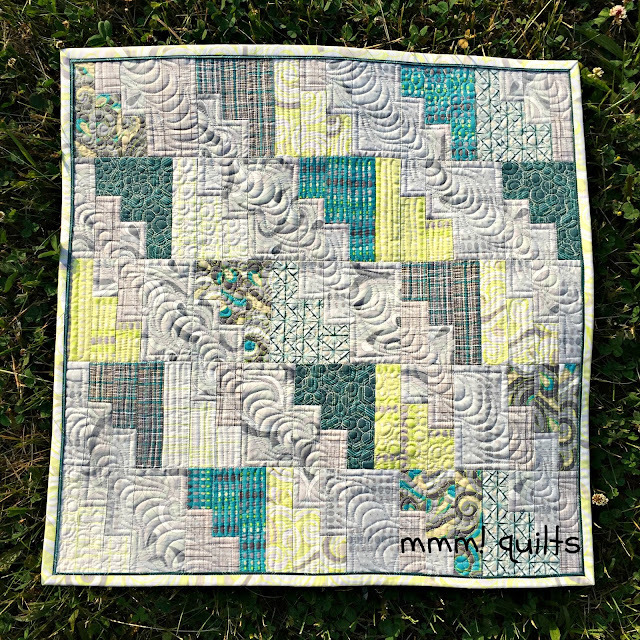 I was going to go back and do a few random horizontal lines, but I liked the look of the back and forth, and LOVED doing it with the FMQ foot, so fast, so freeing and not perfect. Here it is in the shade on the patio. I did Susie's Magic Binding, here, which gives you a flanged binding entirely done most effectively by machine. I did this one narrower than she calls for; I prefer 2.25" binding, and hers gives you a 2.75" one which is way too wide IMHO for a mini. I cut the main one at 1.25" and the flange at 1.5" in case you want to do this too. What in the world? you may be wondering. 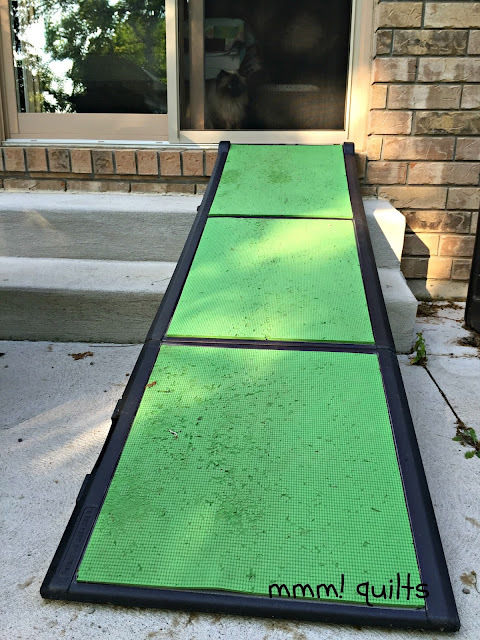 After the patio shot, I turned to go back into the house, and thought you might be interested to see the pet ramp we now have off the patio doors, since Rocco is not allowed to do any stairs. We, well, MacGyver, who am I kidding, glued pieces of an old yoga mat onto it to give it a better grip. Notice another fur kid peeking out the screen?! I love them! I purposely set Textures a little lower than Crazy Hearts, might have to make it more obviously lower...And I just noticed, when I found the post for Crazy Hearts, that I have some of the Textures grey plaid in the low volume background of it! Cool. Interesting: when I wrote about Crazy Hearts, Craftsy had a classes sale on, and if you notice the sidebar button, you'll see they are doing a pretty sweet one this weekend. All classes, yep every single one, are 50% off and some are even more, at $19.99. This is the time to pick one up; I know that's when I got my Angela classes, and I have put them to good use over and over. Free Motion Quilting Negative Space is a great one, as is Machine Quilting: Small Changes, Big Variety. She uses both a domestic and a longarm in these classes. I have done these quilting designs on my longarm as well as on my Bernina. 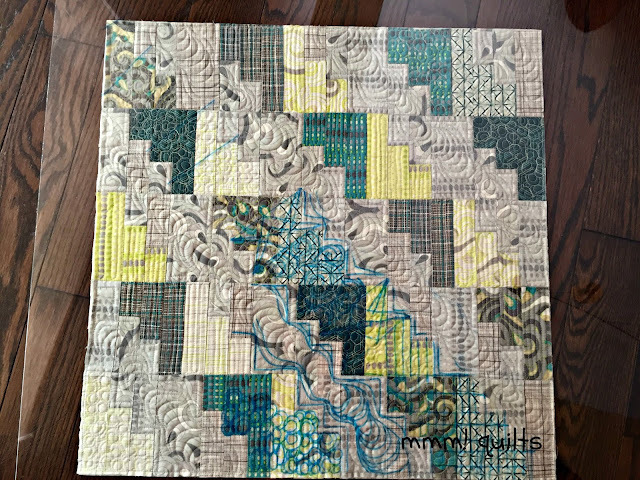 Threads: pieced and quilted with Aurifil #2600 and 2123, fabulous threads, no breakage, no tension issues whatsoever; from piecing to quilting, I adjusted nothing. Scraps left over, always a bonus, and a walk along the lake edge, beautiful scene.Super fabric combination with teal and grey going so well together. So you've gone from freezing to sweltering, eh? Love the colors in your little mini and your quilting is always the bomb. Love the mini! Your choice of quilting which is fantastic as usual. Beautiful shot of the lake. Absolutely gorgeous! And love the pet ramp awwww! The mini is a beauty....I think it's my favorite from your pattern thus far. ( I had to smile---everytime I read a "you betcha" or an "eh"...I think...it's so cute---she's speaking Canadian!...lol.....No offense intended---as a southern West Virginian I hear similar things said about my accent and colloquialisms---hopefully, as intentionally unoffensive as I intended---). I've been using a square of plexiglas for some time now to audition quilting patterns. Mine is only 16 inches square. I found that size fits nicely on my Avante...sometimes I need a block by block plan. 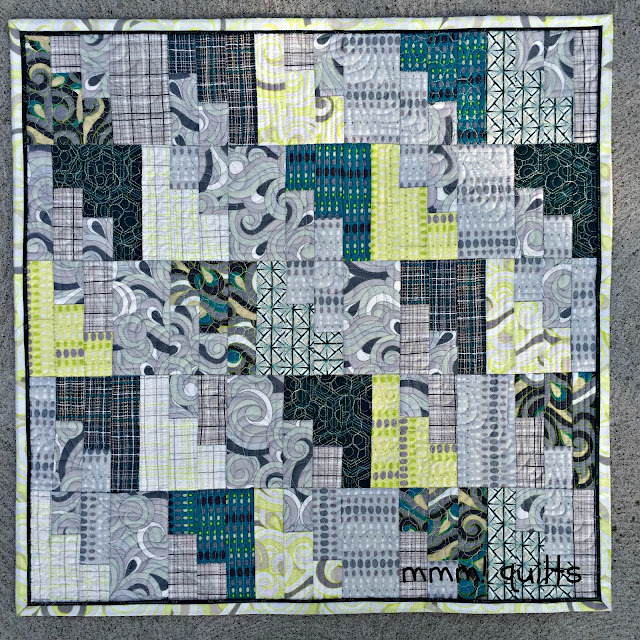 To get an idea for the quilting plan for the entire quilt I just rely on a basic drawing of what I think I may want and then finalize it block by block after the quilt is in the frame. 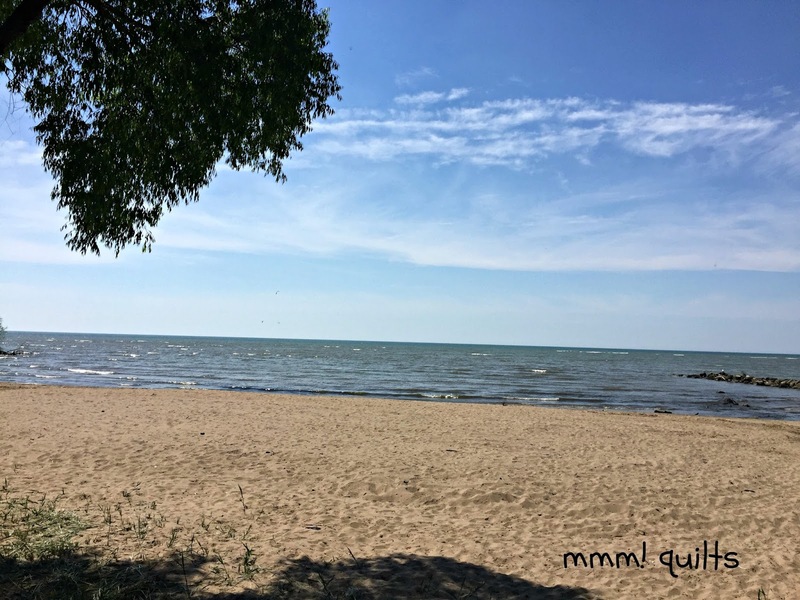 Thank you for the picture of Lake Erie....it's been many a year since I saw it in person. Blessings from sunny...and very hot....southern WV. 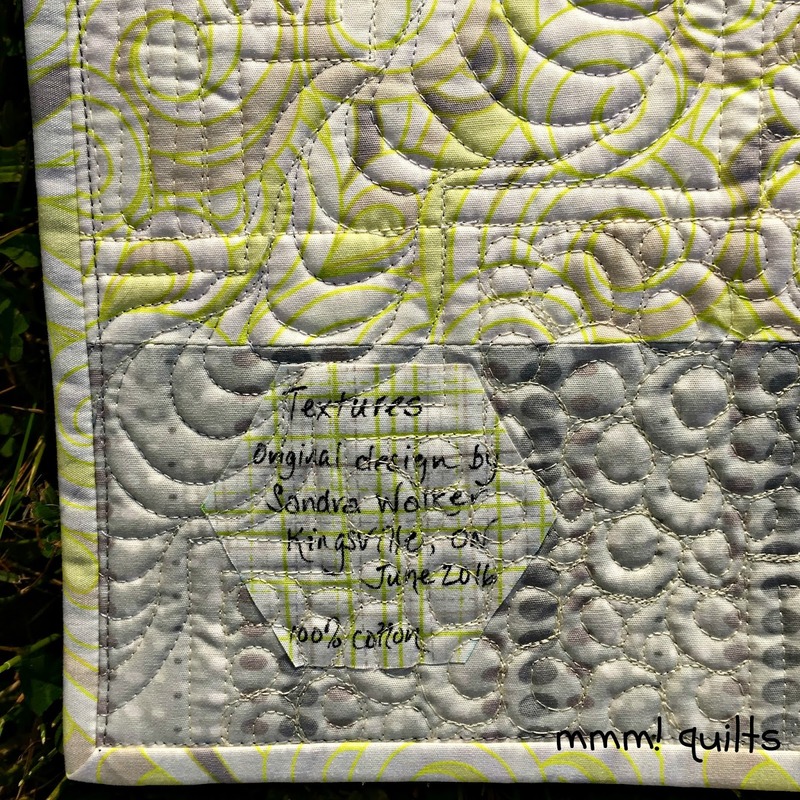 The quilting you did on your mini Textures quilt is awesome Sandra! I love the way your pattern looks in this size too. It looks good on your vapor barrier show wall, LOL. 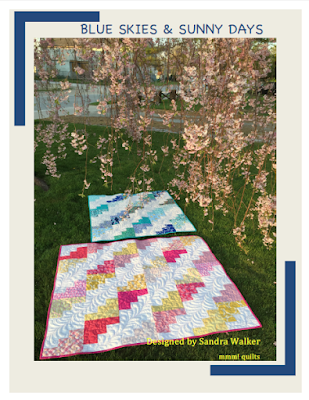 Really all three of those quilts are beautiful! I can imagine you starting a 20 inch mini craze. Thanks for the really sweet shout out Sandra. A very cool label! I have something up my sleeve to show you all soon. Ugh - I remember the fishflies last year. MacGuyver devised a very clever pet ramp for Rocco! I love minis of patterns and yours is so cute! Oh I did recognise the pattern - having been a visitor to Tish's blog recently! Love the colours you made your mini in and the quilting is gorgeous. I am going to have to follow the link for Natalia Bonner!! 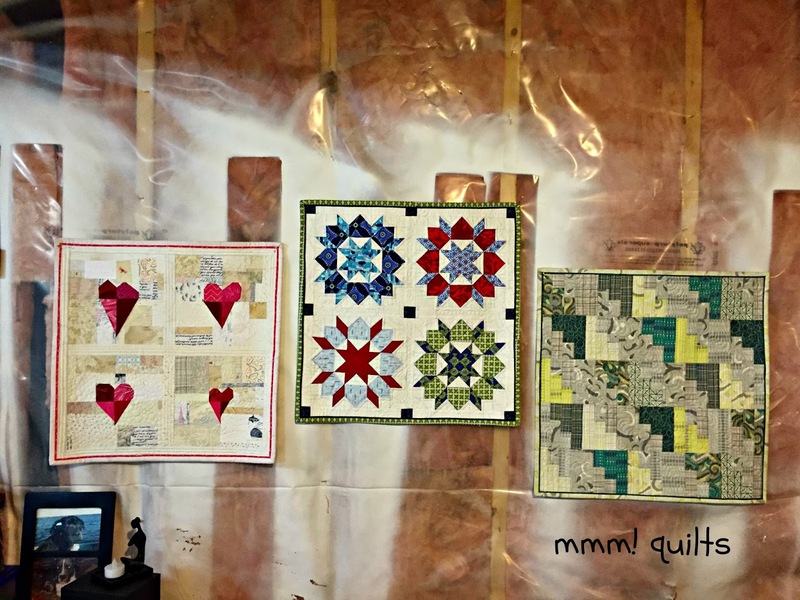 Your mini quilts look so good together. 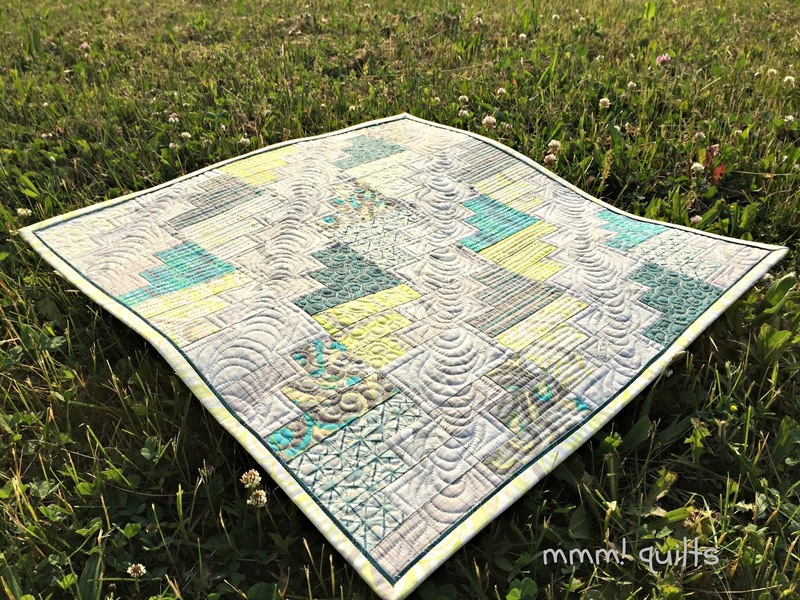 And the quilting fits your lake theme too. I see ripples and pebbles. Beautiful mini! The quilting really accents the patterns. Okay, at first I thought that was a picture of Bella. You know looking longingly at you wondering why you are depriving her of a modeling opportunity??? MacGyver did a great job on Rocco's ramp. It's had to have made things much easier. 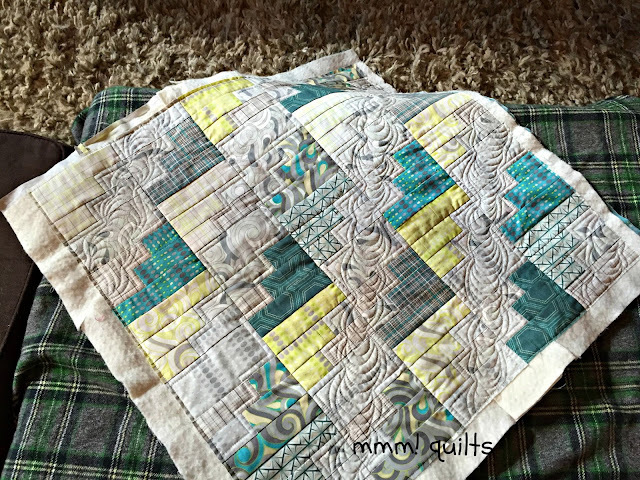 I love the quilting you did on this one. I may have to direct our quilty son over here to check it our since his still isn't completely quilted yet.